Another Christmas has come and gone! I swear, it goes by faster every year! The month of December was so busy, but so much fun! 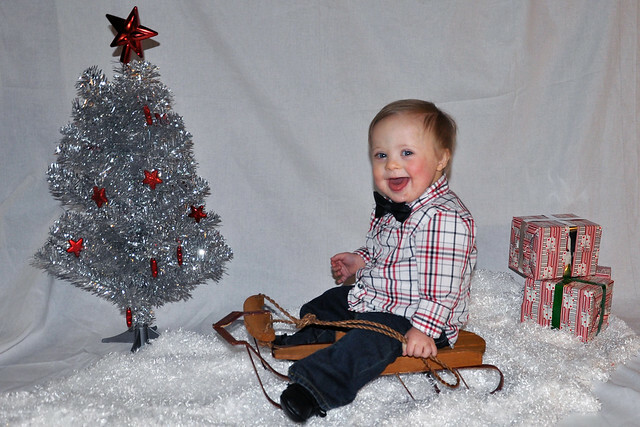 We had a great holiday season and a wonderful Christmas. I'm looking forward to some down time so I can finally go through my 1000+ pictures, and share our memories! 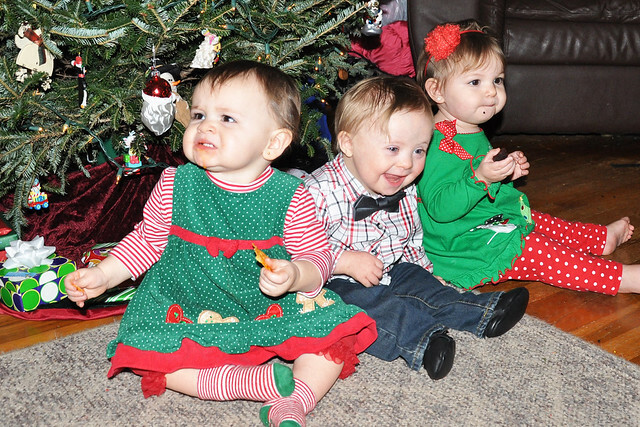 On December 13th, after a Pictures with Santa event, we had our annual Christmas Party with our friends. We look forward to it every year! My friend, Amber, started this tradition many years ago. At that time, our group of friends only had 4 children, including Dylan. As the years passed, we met new friends and added them to our group, and we all had more children. Now, we have quite the crew! 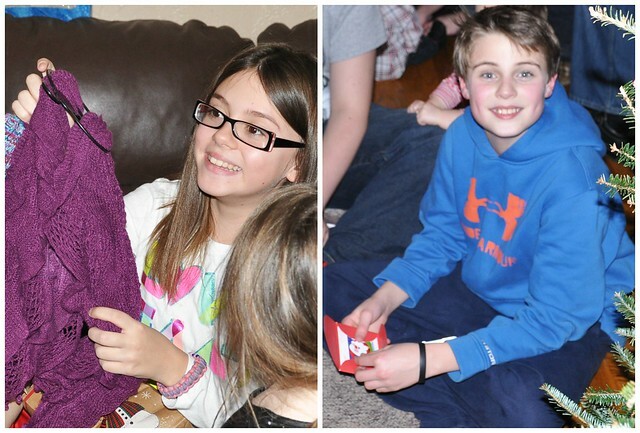 We started off the party with the gift exchange between the kids. 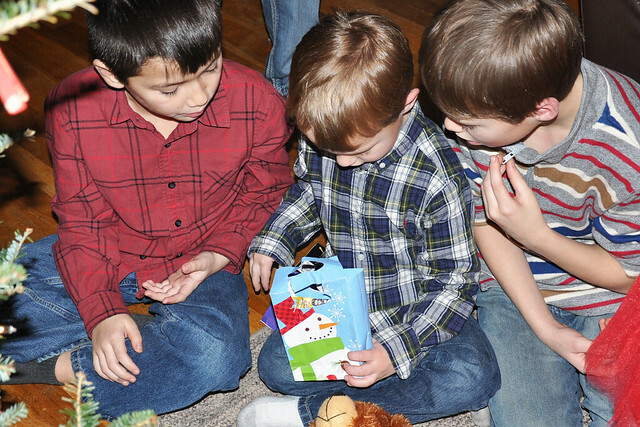 Each child buys for one of their friends, and they take turns opening their gifts, starting with the youngest. 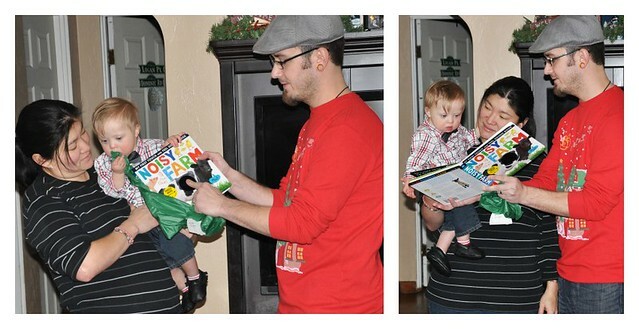 The baby/babies celebrating their first Christmas always get gifts from everyone. 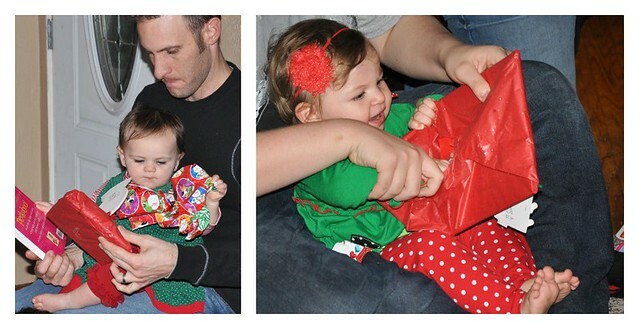 This year, it was Amelia's first Christmas, so she kicked off the fun! 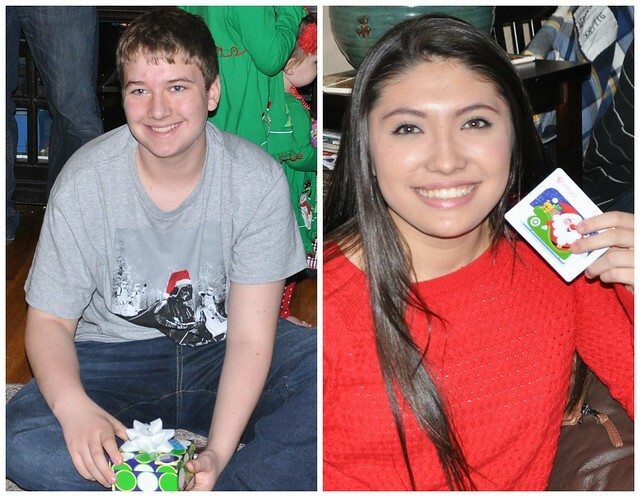 The kids loved watching each other open gifts, and they were all happy with what they received! 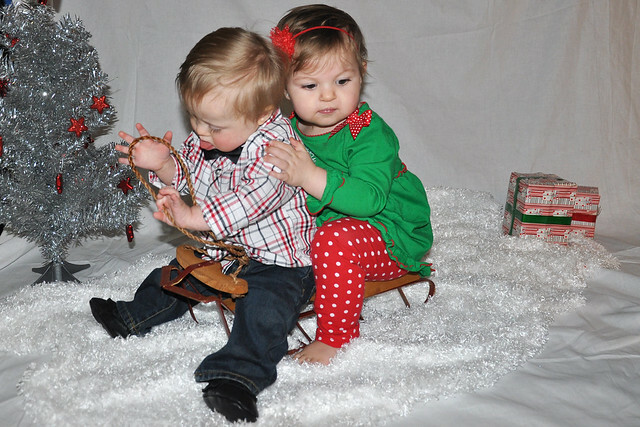 Amy and her family had somewhere else to go, so we attempted a few pictures of the babies in front of the tree before they left. Attempted being the key word! It was pretty much impossible! I love the outtakes the most! Liam quickly realized that he was the only one who didn't have food, and tried everything to get a bite. The sequence of the pictures was perfect! Step 2: Reach for brownie. Step 3: Try to grab brownie out of friend's hand. Step 4: Try to grab brownie out of friend's mouth. Step 5: Give up and laugh for a second. Step 8: Chase friend across the room for more! After Amy and her family left, we all sat down for a delicious dinner. Shortly after dinner, Lily fell asleep for a much needed nap in Charlie's bed. 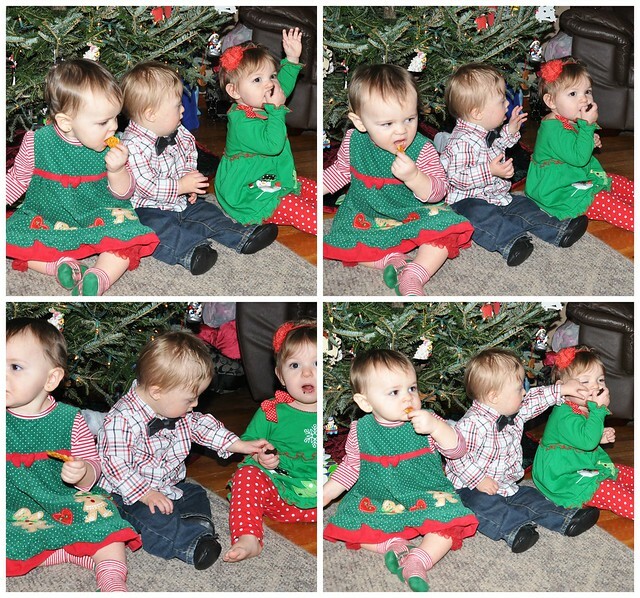 The rest of the kids were occupied, so we tried to fit in a quick photo session in the basement. Everything was going great until Liam hit his head. He was consoled, but as soon as I sat him back down, he started crying. 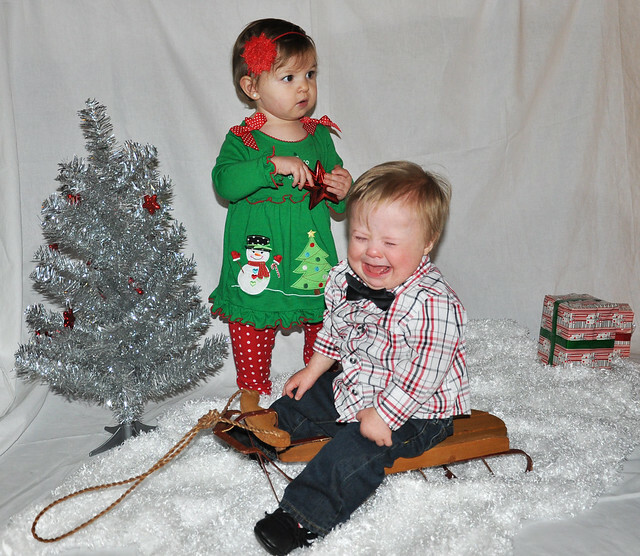 Photoshoot over...but the last four pictures were so funny! Liam rarely cries, but when he does, his expressions are epic! 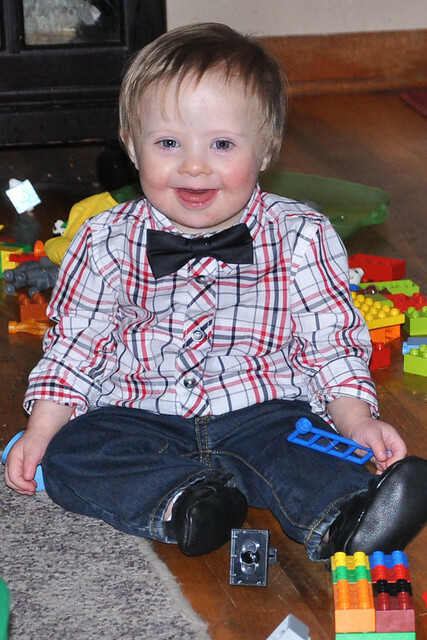 The moment I sat Liam down upstairs, the smile returned to his face! 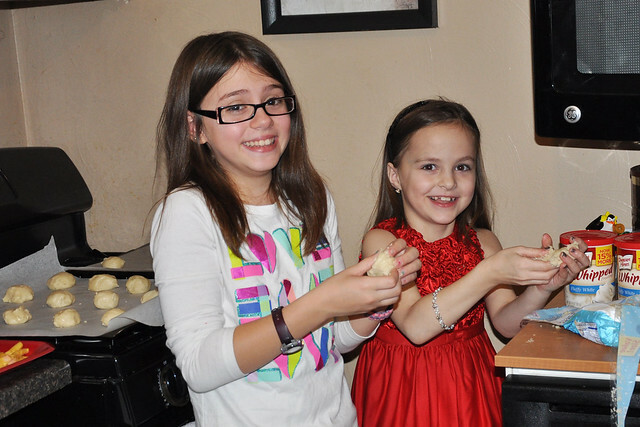 Lily woke up from her LONG nap and began playing with her friends, the boys played for hours, the babies played in the living room while we talked, and the older girls baked cookies. We had such a fun night! I love these kids SO much! 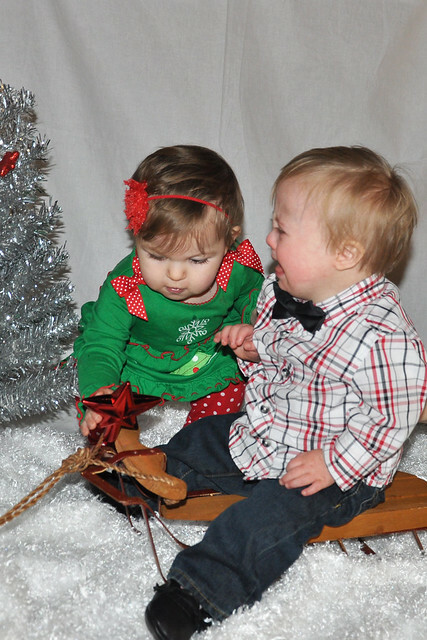 This tradition started with 4 kids, and ended up like this. We are so lucky to have each other! Oh my gosh finally! I have been checking for days.. LOL looking for your Christmas post. 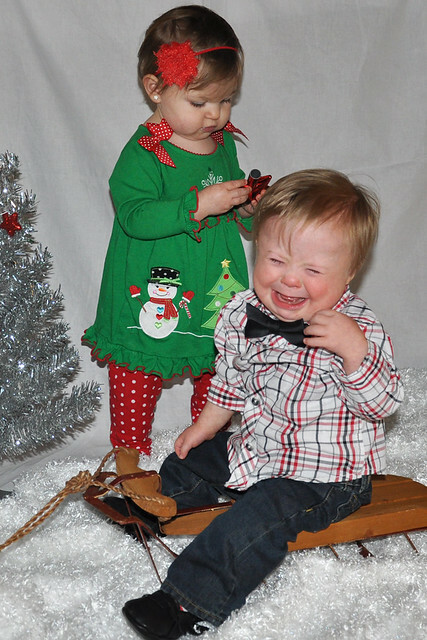 So enjoyed the pictures especially the kids expressions. 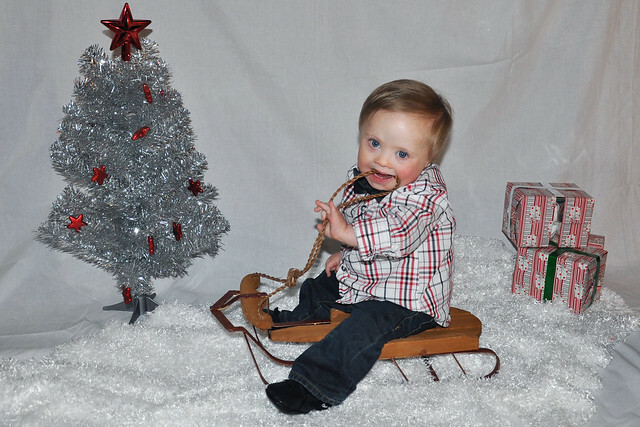 So glad you have a fantastic Christmas and I wish you and your family and friends a "Happy New Year"
Liam has the best expressions in those pics! 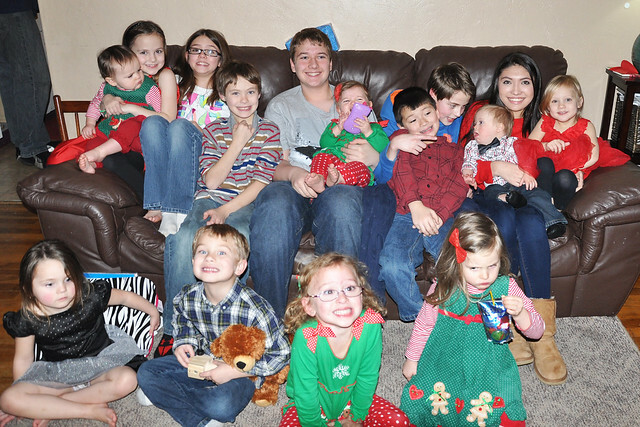 Hard to believe our little Christmas group grew from 4 of us (each with one kid) to being outnumbered by children. They all grew up so fast! Oh sweet liam! And what a celebration- merry Christmas friend! Okay - I barely got passed the brownie scenes!! That was hilarious!!! 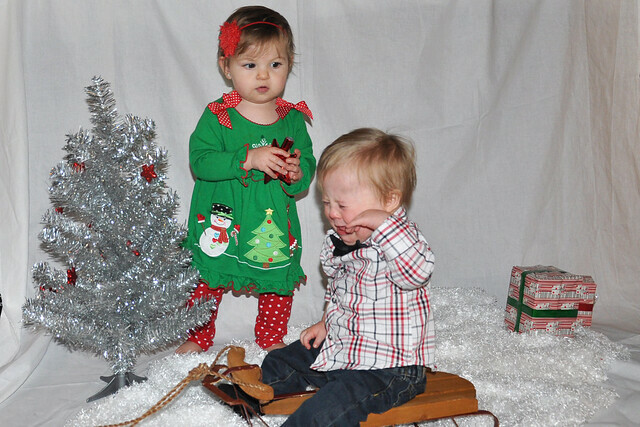 Take pictures of toddlers is always an adventure and the outtakes are actually the best in most cases!! Great captures! 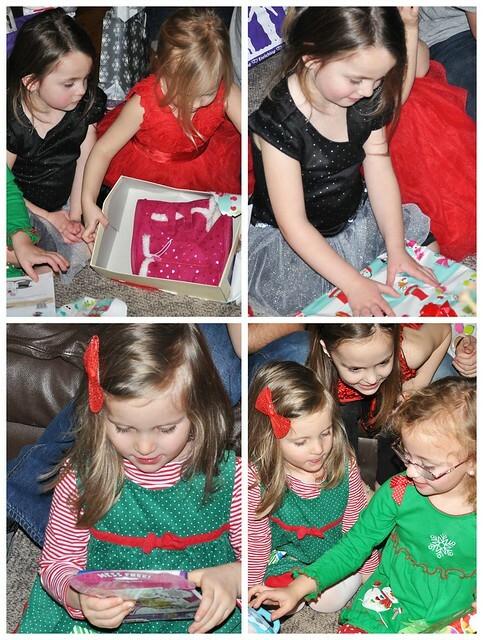 Your kiddos are so adorable - and it looks like Christmas was amazing for all! Haha! Thank you! He was very determined! What a fun party. I swear Liam's expressions are just the cutest! 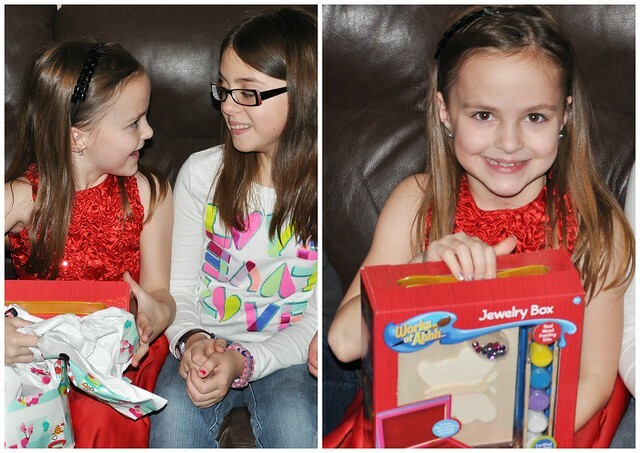 I love the idea of every child buying a gift for a friend. We might need to try that with our own little group (with only 6 children). Belated Merry Christmas to you! 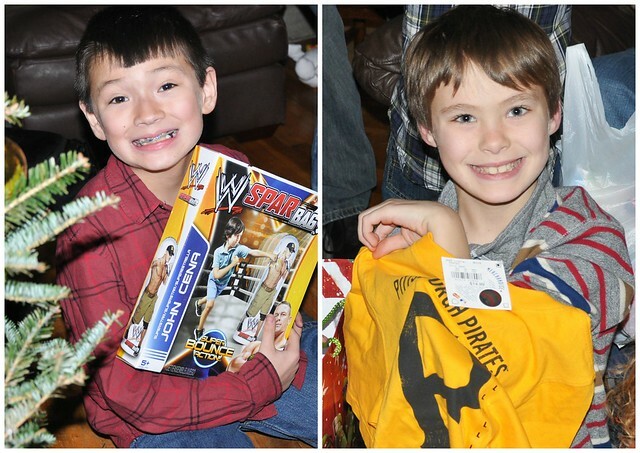 Looks like you all had a great Christmas! 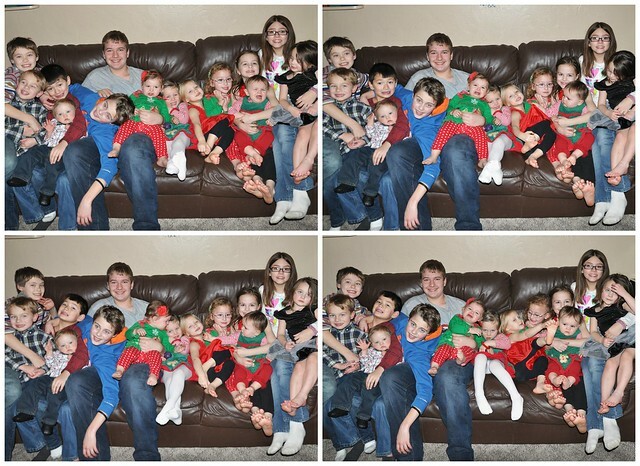 I always love pictures of a bunch of kiddos piled up on the couch.